Manny Pacquiao & Floyd Mayweather are really building the hype behind their much-anticipated fight. A fight that isn’t even booked yet, although some sources argue they are very close. Money, politics and a lot of other hurdles have always got in the way of Manny Pacquiao & Floyd Mayweather fighting, but it doesn’t stop everybody from talking about it. Even “Hands Of Stone” Roberto Duran wants to see that fight. Duran also acknowledges that the bout should have gone down 5 years ago. Still, both are on winning form at present, and negotiations are allegedly still underway. That being said, “Pac Man” is being linked to fights with Amir Khan and Jessie Vargas. 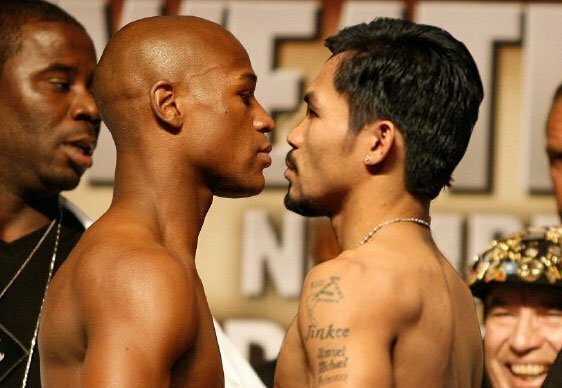 Allegedly Mayweather is telling Pacquiao to ‘stop lying’ about “Money” not wanting to face him on May 2nd….